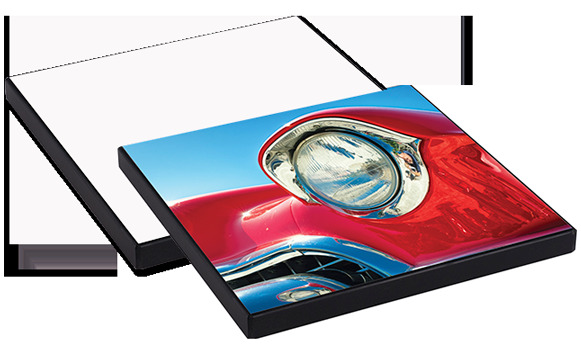 ChromaLuxe Table Tops offer HD quality image reproduction while providing resistance to stain, scratch, moisture and chemicals. The tables are a semi-gloss finish with two shapes and two sizes to choose from with a black rubberized edge. ChromaLuxe Table Tops provide you the option of customizing furniture for a variety of residential and commercial spaces. Images are infused into the most durable coating in the world to provide a vibrant image, and a scratch resistant result that will last a lifetime. ChromaLuxe Table Tops start with 3/4″ moisture-resistant board it is then banded with a black acrylic banding before going through the sublimation process. Remove protective film before pressing. Secure the transfer to the back of the product with heat tape before pressing. Always use protective paper above and below the product you are pressing to protect your heat press from stray ink. Use a Magik Eraser to remove any excess paper left behind on the rubber trim.